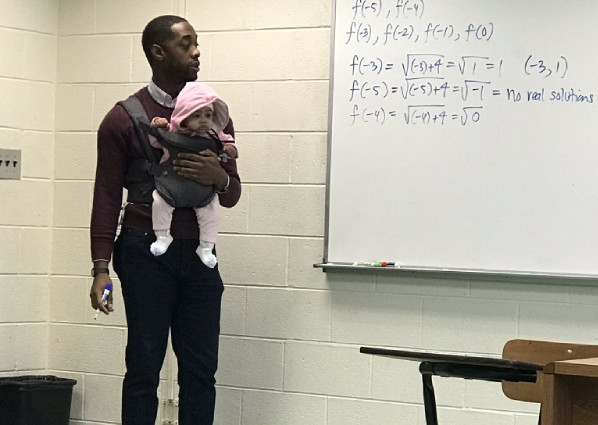 A college student couldn't find a babysitter for her baby daughter so he bring it to his math class and his Georgia professor offered to carry his daughter so he could follow the lesson for the day. A heartwarming scene was shared on social media by Nick Vaughn, a classmate of the child's father Wayne Hayer. The photo shows the professor Nathan Alexander teaching a class while carrying his classmate's baby strapped to hes chest. The father explained to his professor, he couldn't find a babysitter and he doesn't want to miss the class as midterm looms. The 34-year-old professor offered to hold the infant so Hayer could follow and take notes. The teacher told CNN, part of is role as an educator is to provide opportunities for students. Alexander is James King Jr. Visiting Professor of Mathematics teaching at Morehouse, where he teches mathematics education, statistics and mathematical modeling, and social networks and graphs. The photo has garnered over 300K likes since it was posted on March 1.